Carrying your own reusable water bottle: still plastic? Home Plastics Plague Carrying your own reusable water bottle: still plastic? Culture Change Letter #222 - There are two healthy trends going together: rejecting plastic water bottles, and appreciating good ol' tap water. Reasons include the need to cut waste: at best, 17% of plastic water bottles are recycled. Only about one percent of plastic bags are recycled. Of these and other plastics, over 99.9% of it is petroleum. Landfills and incinerators handle the great bulk of this non-biodegradable toxic trash, and a huge amount resides in the oceans. Regarding the major issue of appreciating water as a right or public utility, paying for water to enrich corporations is anathema to more and more of us. So the trend toward reusable water bottles is heartening, even if it's not as good as being able to rely on your nearby pristine stream or the water fountains that every town should proudly offer. Firms such as Kleen Kanteen and Sigg are making fancy metal water bottles that are free of plastic except for the lids. As for reusable plastic water bottles, they still dominate, but increasingly with the fortunate removal of bisphenol-A (endocrine disruptor being banned in Canada) from the polycarbonate plastic. First, Tappening boasted that its initial run of 39,000 plastic bottles were snapped up. I was horrified about the plastic. Second, a claim is made in the release (see bottom) that petrochemical pharmaceutical drug traces are safe in tap water. This flies in the face of many scientific studies showing bisphenol-A to be potent at the minimum of minimum exposure: 0.1 parts per billion, causing cancer, diabetes, obesity and birth defects. What we think we know about "safe" plastics today might be just a repeat of our ignorance in the past about bisphenol-A. RESOLVE TO SAVE $1400 (or more!) IN 2009 BY GIVING UP BOTTLED WATER! (December 23, 2008; New York, NY) The ‘Tappening’ campaign has been instrumental in helping forge a national movement that encourages people to make tap their water of choice, whenever possible. The campaign (which Adweek has called “a form of business philanthropy…founded to right a perceived wrong”) and its website--www.tappening.com–-both launched in November, ‘07, have served to educate the public about the extreme and unnecessary waste of resources and pollution of the Earth caused by the bottled water industry. --a 20 ounce bottle of water on average is $1.50. --Four (4) 20 ounce bottles per day = 8 glasses = $6 a day. --$6 per day X 365 days = $2190. --Making allowances for days when an individual may not drink the full recommended amount, for possible discounted prices when buying bottled water in bulk, and for the cost of an optional home water filter system (i.e.-Brita or PUR), the folks at Tappening conclude that the average annual estimated savings for an individual who switches from regular bottled water intake to tap water would be approximately $1400! Using the figures and allowances above, the average estimated savings would be $5600 per year!! In an effort to self-finance the campaign, the Tappening co-founders—PR honcho Eric Yaverbaum and advertising CEO Mark DiMassimo--introduced their own line of well-designed, reusable water bottles. To their surprise, the Tappening bottles became trendy practically overnight. Their entire initial inventory of 39,000 plastic bottles sold out in 36 hours after launch of the website! 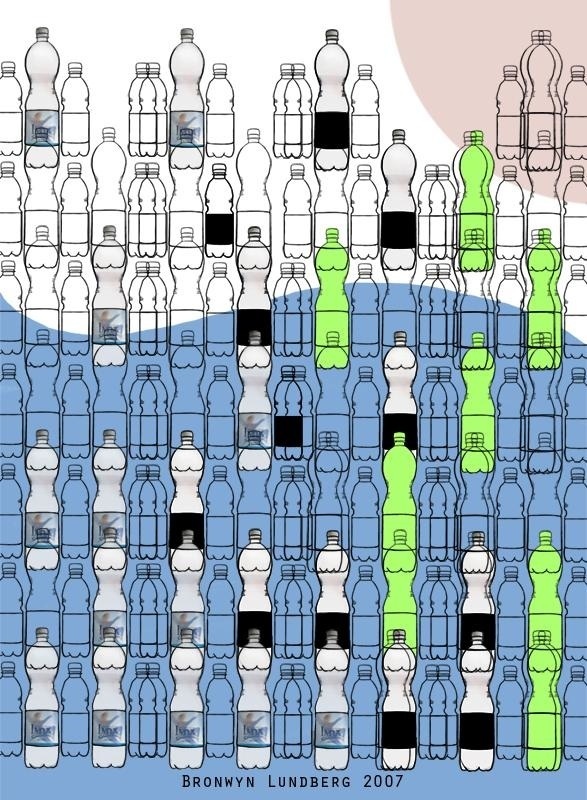 To date, over 350,000 Tappening bottles have been sold. The 100% BPA-free plastic bottles are available in green or in blue. The Green bottle says “Think Global, Drink Local”; the Blue bottle says “What’s Tappening?” ($14.95 plus $3 s&h). The stainless steel bottles are available in Silver, Blue, Gold and Red ($18.95 plus $3 s&h). The campaign and bottles have been touted by media and bloggers across the country, from People magazine to Forbes to Scientific American. The bottles are available for purchase at www.tappening.com . All of the money raised via the sales of the bottles has gone directly back into the educational website and campaign. ***high res images of Tappening bottles and bag available upon request.